What's not to like about this model? 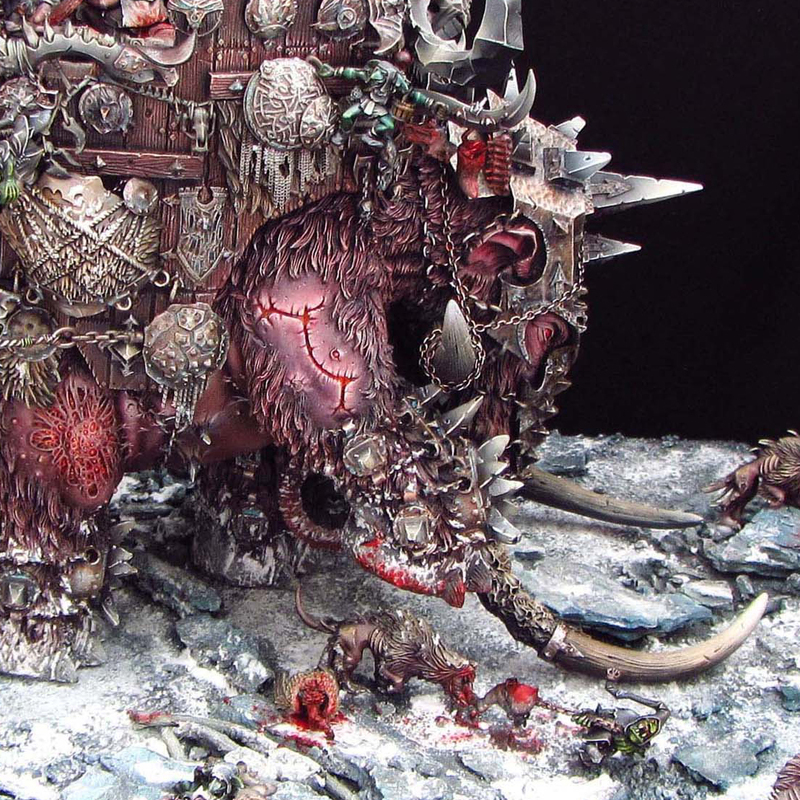 The Forge World Chaos War Mammoth is already a great model and the paint job on this is top notch. Really, every part of this is painted very well. The skin truly looks raw and all of the colors are suitably realistic looking. The stand out part of this mini (can you even call this a mini?) is the base and diorama it's in. The snow and ice look incredibly realistic, which is no easy feat. You have to achieve that perfect mix of slushy snow and fresh white snow. The Chaos Hounds running around it's feet really give it a sense of movement too. You can just imagine them darting between its legs as it stomps forward. Last, but not least, we have the Goblin Fanatics whirling around smashing Hounds into the snow and bouncing off of the side of the Mammoth itself. 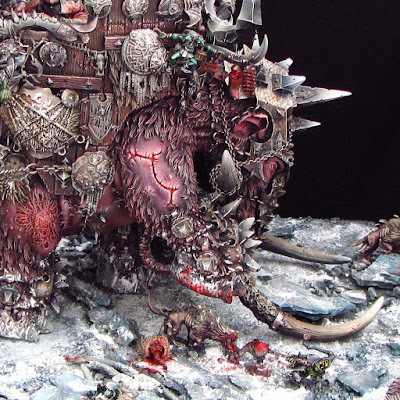 Not sure why there are Ogres in the howdah, but it looks great nonetheless, and the addition of the Stonehorn head on the front helps tie them in. 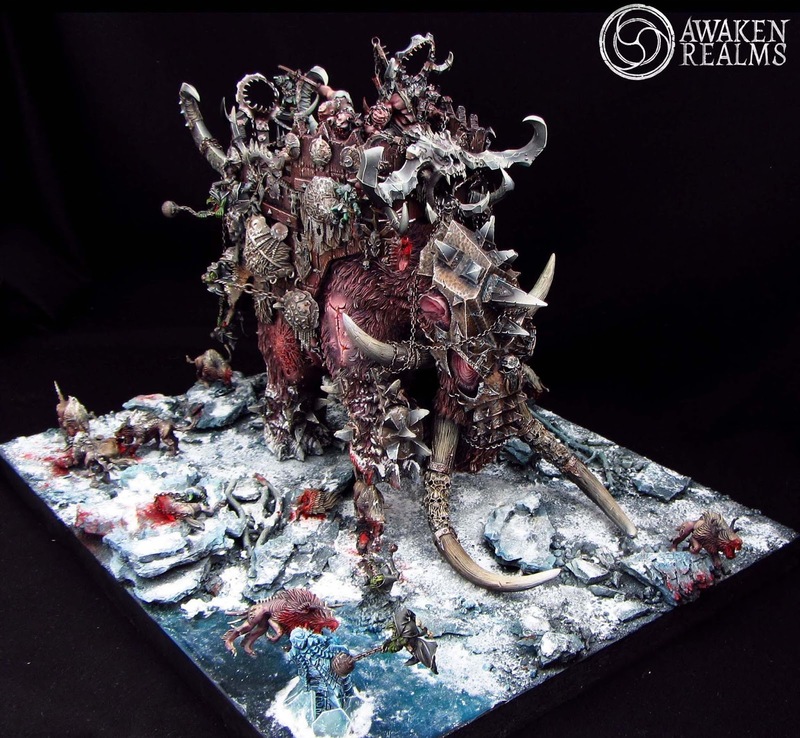 All in all this has a great sense of narrative and truly evokes the visual idea of this gargantuan creature plowing through the Orc battle lines on a frozen tundra.